SVC TELEVISION, LONDON REMASTERED 1991 with STEREO. This is the gem of the package, it's an upgrade from previous releases of this concert film, but not quite up there with the footage from the Anthology DVD. Here's a quick and dirty comparison. Click on the photos for a closer look. So it appears that the HMC source was a generation away from the master used for Anthology, or they may have discovered a better source or improved the restoration before including it in the Anthology TV series. There were also a few digital artifacts on my screen just as the Beatles went on stage for the show, but those artifacts were gone for the rest of the concert. These may have been imperfections on my disc, though. The audio is good, but not great. Still, it's mostly stereo, and that's a first. About the CTS recordings: A secret booking was made for The Beatles to re-record some of the instrument parts on January 5, 1966. The session took place at CTS (Cine Tele Sound) Studios at 49-53 Kensington Gardens Square in London. New bass parts were overdubbed onto "Dizzy Miss Lizzy", "Can’t Buy Me Love", "Baby’s In Black" and "I’m Down", Lennon also recorded a new organ track for that last one. The Beatles then made entirely new recordings for "I Feel Fine" and "Help! 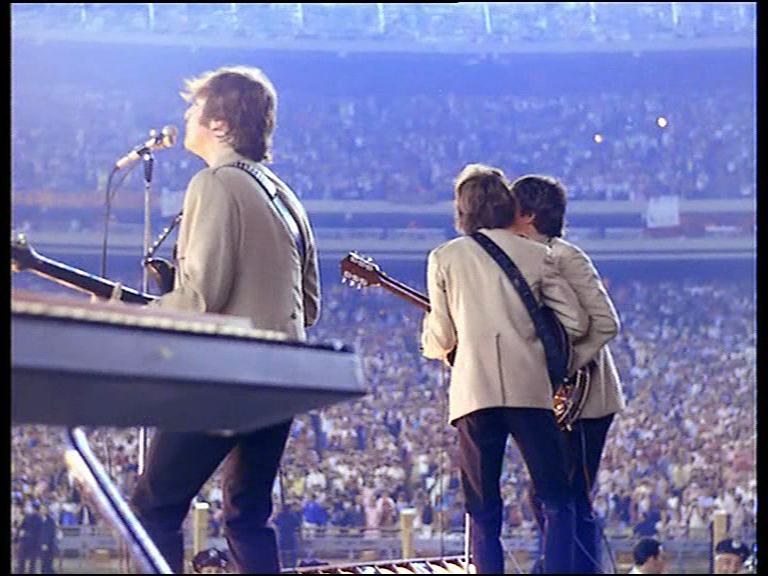 ", and the group also recorded overdubs for "Ticket To Ride". It looks like Furmanek has worked on a song-by-song basis, perhaps because using the CTS tracks means losing the stereo, as they were recorded in mono for the then mono-only TV broadcasts. 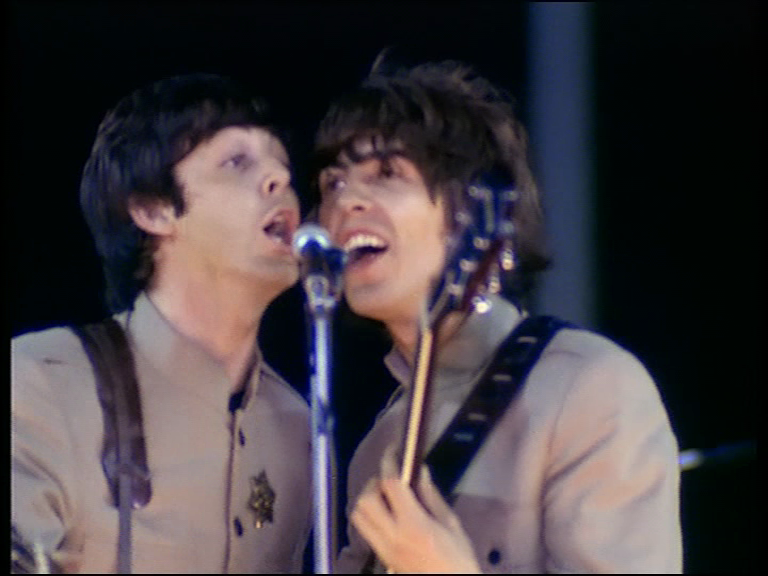 From the CTS recordings, only the two remakes have been used, plus the overdubbed "Ticket To Ride". The CTS tracks sound much crisper here than on the old film soundtrack. Ironically, the screaming crowd is very faint on the live audio, so for the film George Martin (or someone) overdubbed extra screaming from the Hollywood Bowl concert. Furmanek has taken a different option and added some crowd noise in between, but not during, the songs. They seem to be taken from a baseball match as it is very obviously a male crowd. I was not too happy with this choice, but it's a minor gripe considering that the audio is generally a huge improvement. 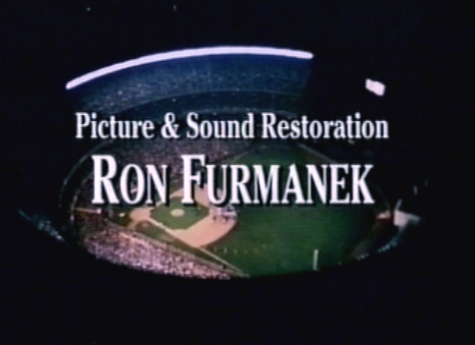 Apparently Furmanek created the stereo mix by synchronising two different mono mixes, and as such it's more of a subtle stereo spread than a proper stereo recording. One very noticeable problem with the audio is the lack of bass. This can easily be improved by extracting Paul's bass overdubs from the original film soundtrack and add them to this audio. The technology may not have been available for doing this back in 1991. No doubt, future bootleggers may exploit the version presented here and improve on this. Unless Apple beats them to it, the original 35mm film could easily be rescanned and presented on Blu-ray. COLLECTOR’S COMPLETE CONCERT VERSION. As good as the idea of just having the Beatles concert segment of the film is, the problem is that the new film source has not been used, nor it's audio. This is filler material, taken from the freely distributed Cathode Ray Tube Collection, which used a VHS recording off BBC Television as film source and has a mono soundtrack from the audio prepared in the CTS studio. "She's A Woman" has footage from the NME Poll Winners Concert, where they were wearing the same stage costumes, but is in black and white. 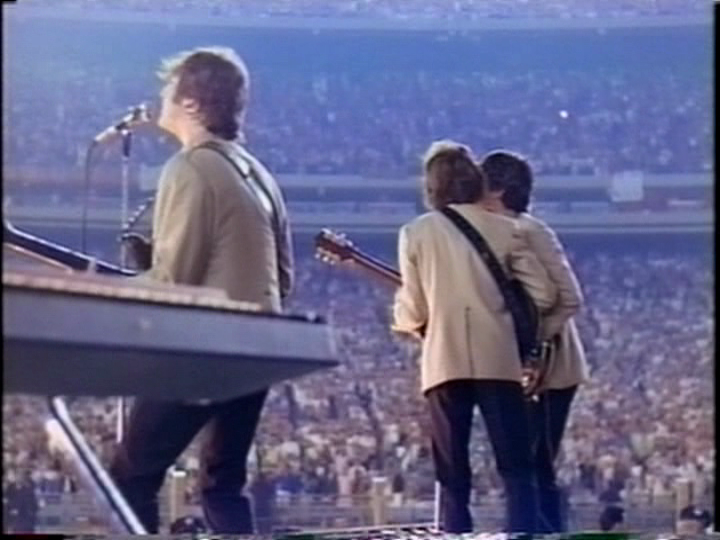 "Everybody's Trying To Be My Baby" uses footage from unrelated scenes in the Shea film to accompany the song. 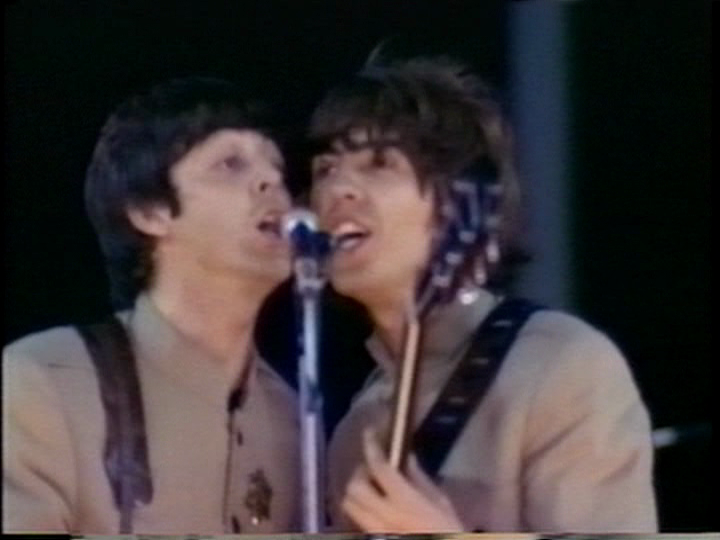 This segment of the DVD would have benefitted from using the same source as the complete concert film. After all, it's nice to have just the Beatles concert for repeated viewings, and to have "I'm Down" closing the show, not opening it. 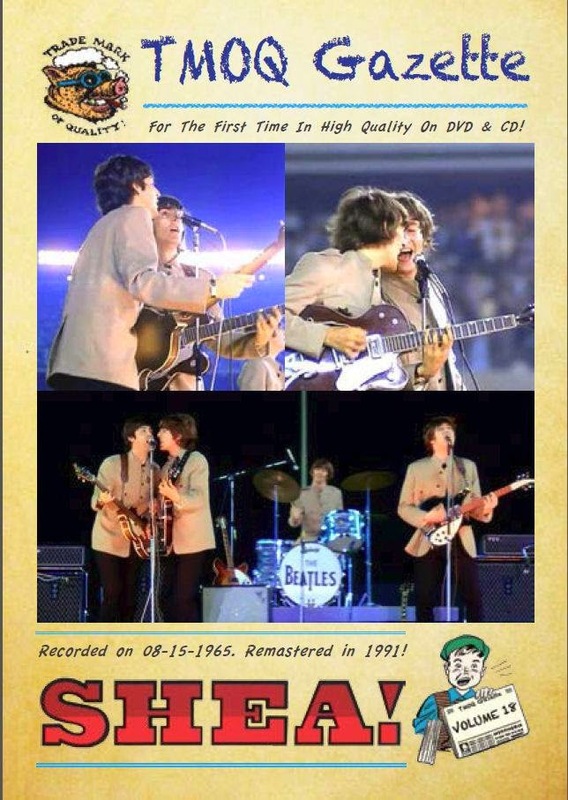 The never before bootlegged complete "The Beatles Abroad" was nice to hear. Brian Matthew narrates, and the songs are from the Help LP. 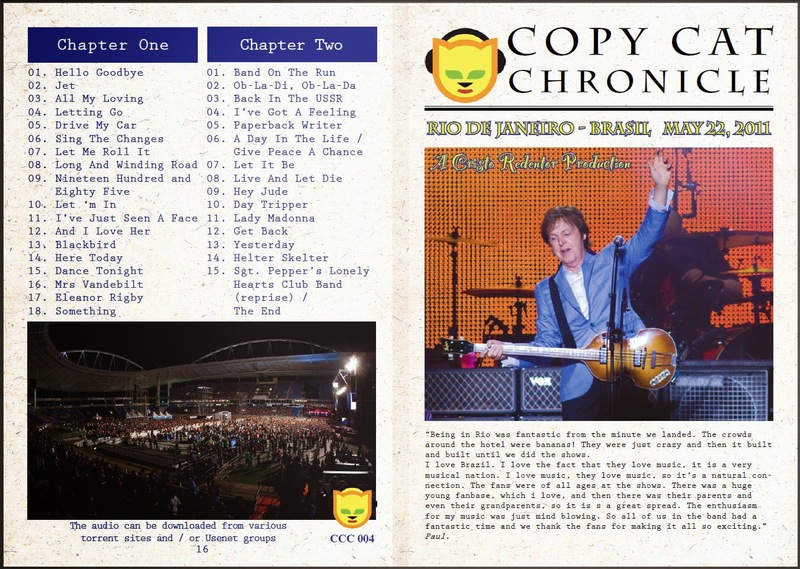 The two discs are housed in a flimsy TMOQ Gazette 24 pages booklet with text and photos from the concert. To sum it up: yes, this is an essential purchase - but one that can still be improved upon. The visuals are better than the previous "best" versions (the 1967 ABC TV master with ageing colours and the BBC 1979 TV recording sourced from VHS). Audio can be augmented by adding Paul's bass overdubs. And the Anthology footage shows that even crisper visuals exist. This version's visuals are close enough to the Anthology footage that repairs can be made by editing the two together - viewers won't be too disturbed by the changing image quality. For now, this will be my viewing copy of this film. While waiting for their next major release, the 1972 Neil Aspinall produced film The Long & Winding Road on DVD (which formed the basis of the Beatles "Anthology" TV series, and inspired the Rutles TV show "All You Need Is Cash"), HMC will soon release on their aptly named Copy Cat label a 2 CD set of a concert by Paul McCartney, Rio De Janeiro, Brasil, 2011. This has circulated before on both audio and video, but will be in their gazette style packaging and with real silver CDs. Why is no one releasing the original footage with the original in house recording of the audio? Why always that faked sound?